LANGLEY — Welcome to the new world of B.C. senior girls high school basketball. The 2019-20 season will usher in a four-tier world. Combine that with a totally revamped system of zones throughout the province and the road map on many levels will look unrecognizable. With all of that said, here’s our first look at the pre-preseason Top 10’s, beginning with the Double-A tier. Note that nothing is as yet etched in stone. Programs which initially trend towards playing up in larger tiers may yet elect to move down to their actual tier size, while others who are sitting at their actual tier may decide to move up. Topping the list are the Langley Christian Lightning, coming off an impressive third-place performance at the provincial championships. 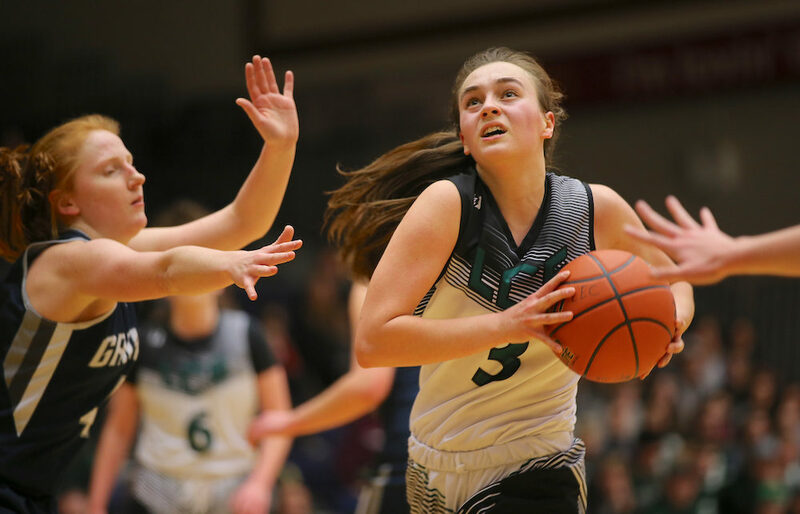 The Lightning fell victim earlier this month to Deanna Tuchscherer’s dramatic last-second baseline shot in regulation time before falling 74-68 in overtime in the provincial semifinals to Chilliwack’s G.W. Graham Grizzlies. They rebounded, however, the very next day with a 63-42 win over North Vancouver’s St. Thomas Aquinas Fighting Saints to finish third. LCS graduates seniors Hailey and Jenna Van Roekel but return eight others, including guard Makenna Gardner who leads a dynamic class of fellow rising seniors in Ava Krepp and Kate Vanderzalm, rising Grade 11 Kate New and rising Grade 10s Lainey Shelvey and Taelor Coxford. STA’s Fighting Saints are right back in the thick of things at No. 2, led by the rising senior triumvirate of Jessica Clarke, Gemma Cutler and Caelan Prescott.